Another day, another media montage allegedly offering a glimpse at Apple’s next iPhone – in a couple of posts to his Twitter feed, leaker Benjamin Geskin has shared a number of images as well as a video, showing what the iPhone 8 may look like based on the current streak of rumors. Instead of using rendered images, however, Geskin has made use of an alleged 3D-printed iPhone 8 dummy unit along with a couple of neat tricks to give viewers an idea of what the dead slab might look like with its screen turned on. While we’ve seen the dummy model before, it’s the leaker’s take on how Apple will have the phone’s screen light up that takes center stage here. 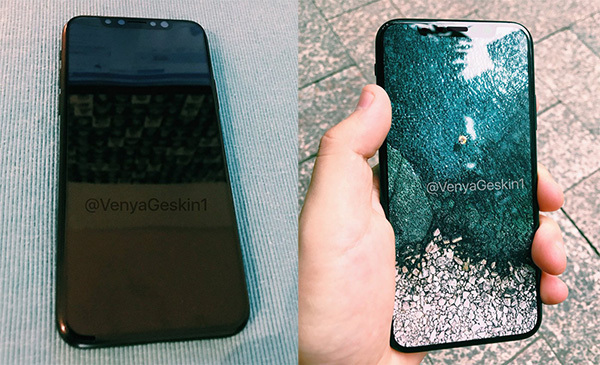 The first of Geskin’s tweets show two images, one of the plain dummy unit, and another that shows a printed wallpaper neatly stuck to the front panel of the same unit with a screen protector, offering the illusion of an active shiny screen. True to current rumors and leaks, the images show thinner bezels on all sides of the Home button-less front panel along with a trough along the top for sensors. The wallpaper, for those wondering, is one of the new ones that come packed with the latest iPad Pro lineup. The second tweet simply offers a video hands-on of the same. iPhone 8 leaks and rumors have begun to reach their apex quite early this year, with all consistently agreeing on the same bezel-less design without the Home button. If Apple does (or has already) gone through with this design, it would be the first time, if memory serves me right, that the company has opted for an asymmetrical (if only slightly) front panel, with the screen extending to either side of the sensor trough at the top. As always, though, everything is technically conjecture till the very end, when Apple finally reveals the much awaited superphone. Wow most interesting thing I’ve seen all week. I’m still not paying 1000 for it. Dont then. I will, and so will millions of others.